The concept behind this successful auteur restaurant is to reincorporate native meats which have been excluded from popular cuisine. Their nine course tasting menu which changes monthly includes innovative dishes made with quail, hare, rhea, alligator, prawns from Puerto Madryn and other local delicacies. A unique approach to the native meat eating culture. Tiburcia Dominguez and her husband Salvador María del Carril spent thirty years of their married lives without speaking to each other. 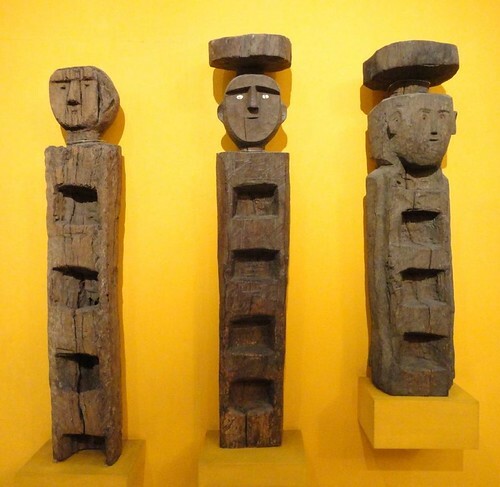 The hatred they lived with for years was taken to their graves after the widow stated in her will that their statues were to be facing opposite directions. Gravedigger David Alleno worked for thirty years in the cemetery, where he destined his life savings to his very own plot in the burial ground that obsessed him. The sad story tells that after putting the finishing touches to his precious spot, he went home and killed himself. Tomas Guido, one of the generals in the Argentine Wars of Independence was originally buried in the Recoleta Cemetery. His tomb, which took the form, a grotto was built by poet Carlos Guido Spano, one of his sons, who took upon the task of layering each stone with his own hands as a symbol of the humility they had always lived with. The Saenz Valiente family was so happy with their servant, Catalina Dogan that they decided to give her a burial place in the prestigious cemetery. Given the class system of the time, they did however bury her at a distance, outside of the family vault. Elisa Brown awaited the return of her fiancée Frances Drummond who fought against Brazil under the command of Admiral Brown (Elisa’s father). Upon his death the young commander handed a watch for the admiral to give to Elisa. The young woman, devastated by the tragic news is said to have drowned herself in her wedding dress to be reunited with the soul of her lover. Making a good asado is an art that any proud Argentine man must master (although there are women that make great asado too!). For this task, two elements are key, one, is the technique used for lighting the fire and the elements that will go in it (coal, wood chips…), and secondly is the knowledge of the different meat cuts and the different cooking points. Obviously, a tradition that is practiced and transmitted from generation to generation involves many different techniques which can’t all be mastered overnight, but you´ve got to start somewhere, so here it goes! 1- Clean the surface on which you will cook the meat. 2-Make 5-6 paper balls by crumpling newspaper. 3-Make a small wooden ‘building’ or jenga like structure around the paper balls using a discarded vegetable box or pieces of light wood. Make sure to leave enough space between the pieces of wood so that some air can pass through and enough open room on top so that you can later light the paper balls. 5-Light the paper balls making sure to watch if the twigs are lighting up. 6- Wait for the coal to catch and once the fire is out move some of the hot embers below the grill. 8-Supervise the bottom of the meats and turn them around when they are toasty until the other side is toasty too. Add burning coal where you feel necessary, but keep in mind, asado is slow cooking method. Also keep in mind that some cuts and achuras cook faster than others. (Chorizos for example usually come out of the grill first). Sometimes, mistakes can result in wonderful surprises. Such is the case with some of the cities hidden passages, consequence of urban miscalculations. These narrow streets are charm filled corners to stumble upon whilst losing oneself in the city maze. Mirrored buildings and an eighty-year-old man who fixes antique clocks make walking into this passage almost like walking into a story. 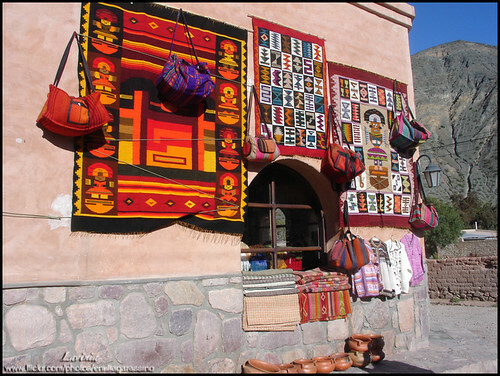 Additionally, the art bookstore and small independent gallery ‘Asunto Impreso’ makes for an interesting visit in the historic neighborhood of San Nicolas. Pasaje Rivarola- Bartolomé Mitre 1300, between Talcahuano and Uruguay. 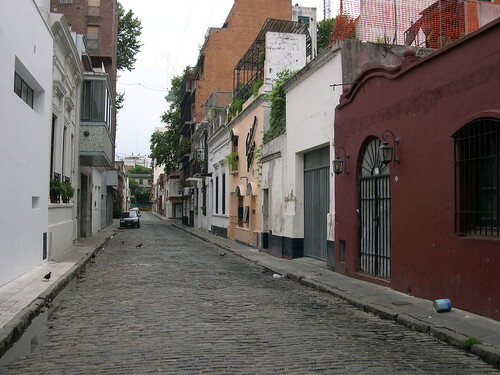 A historic passage in the Palermo neighborhood which housed immigrants and working class in the early nineteen hundreds. The cobblestones and low houses survived the real estate boom and now coexist with the neighboring streets full of high-rise buildings. 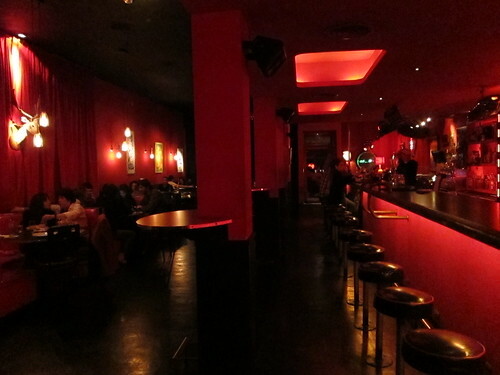 This passage, which Jorge Luis Borges wrote a poem about (La Cortada Bollini), is now home of the Bollini foundation and of La Dama de Bollini, an elegant cultural cafe in which poetry readings, live jazz and exhibitions take place. 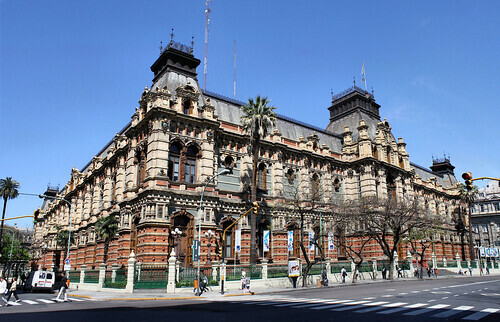 The Kavanagh building in the Retiro area is said to have been commissioned by Corina Kavanagh to avenge the rejection of the Anchorena family of the romance between Mrs. Kavanagh´s daughter (who wasn’t considered aristocratic enough) and one of the Anchorenas. The instructions the architects received were to block the view from the Anchorena palace to the Santisimo Sacramento church they had built (which they were very proud of) with the Kavanagh building. From then on the only frontal view of the church that remains is through the passage. Pasaje Corina Kavanagh- Between Florida, San Martín and Marcelo T. de Alvear. 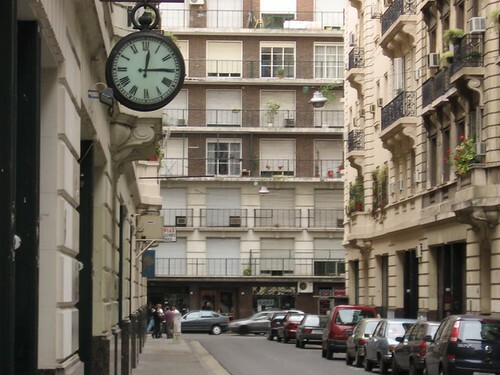 A quaint passage in the Recoleta area with antique French style constructions and balconies. Once residential, it is now a place to stop for something to eat. We recommend brunch at Sirop Folie. Pasaje del Correo- On Vicente Lopez between Rodriguez Peña and Montevideo. 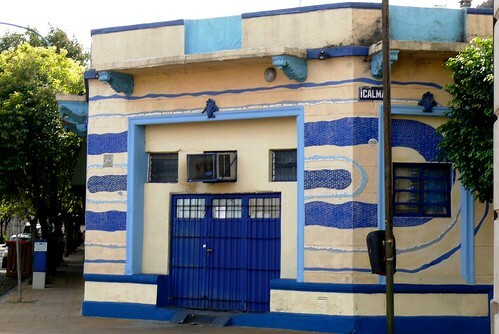 Tango and the Abasto market characterize the Abasto neighborhood, where Carlos Gardel grew up. 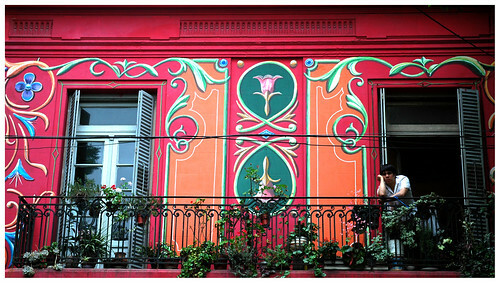 In the neighborhood is a colorful passage of painted houses where cultural activities abound. Pasaje Zelaya- Between Aguero, Jean Jaures, Tucuman and Lavalle. Way of the beaten path, in the neighborhood of Barracas, is a beautiful passage that was intercepted by artist Marino Santa Maria who not only painted the facades of the houses but also decorated them with mosaics and pieces of glass. The historical neighborhood, although somewhat unsafe, is also lined with grandiose houses of early rich immigrants who abandoned the neighborhood after an outbreak of yellow fever. Pasaje Lanin- Between Branden, Suarez Jose Aaron Salun Feijoo and Dr. Ramon Carrillo.